Not only is Mophie’s Juice Pack Air an iPhone 3G battery/case, but it’s the world’s thinnest external iPhone 3G battery/case. That means your battery gets treated to a considerable life boost (no more mad dashes to an AC outlet) and your iPhone won’t run the risk of looking like it’s been given a makeover, circa 1990. The power boosting case packs a rechargeable 1,200 mAH lithium polymer battery that (apparently) “virtually doubles the amount of time you have to rock, talk, surf and send messages”. And it features a “standby mode” that’ll allow you to dictate when you want to make full use of its additional battery life support as opposed to just using it simply as a case. Four helpful little LEDs will indicate how much juice your external battery has left, keeping those dead battery moments to a minimum. 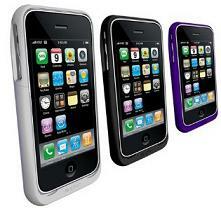 Eager beavers can pre-order their own case for $79.95 in either purple, black or white hues. The more impatient people can wait till they land on Morphie’s website and Apple stores in Spring. Nokia Cupid – the anonymous way to say "I want you"